Some people have realized that, over a period of time, tax-free compounding of your retirement savings could be worth far more than the up-front tax deduction regular IRA’s and 401(k)s receive. That’s one reason for the popularity of Roth IRA’s. Under current tax law, Roth IRA’s are taxed similarly to the dividend-paying whole life insurance policies used for the Bank On Yourself concept: The money that goes into the plan is taxed in the year in which it’s contributed, and can then be accessed – along with all the growth – without taxes due on it, if you play by certain rules. 1. Do you control your money in the plan? 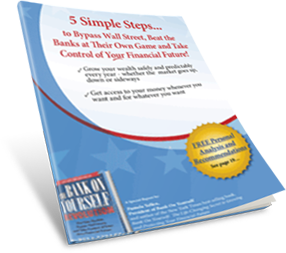 Bank On Yourself gives you complete control over your equity in your policy. You can borrow your equity whenever you want, for whatever you want, and you don’t have to sell your assets to do so. Your money in the policy could continue to grow as though you never touched a dime of it (if your policy is administered by one of the companies that offers this feature). That happens because you receive the same guaranteed annual increase regardless of whether you have a policy loan, and any dividends you may receive are not affected by policy loans. 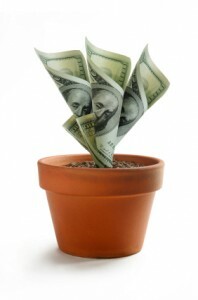 As a result, you have the ability to use your equity and still have it for working for you! Borrowing from your Roth IRA, or even using those funds as collateral for a loan, is considered a prohibited transaction, and you’ll owe taxes and penalties. Although you can withdraw the money you put in at any time without having to pay taxes, you will no longer be earning any interest or investment income on that money. 2. Can you take income from the plan when and how you want? You can take income from your policy when and how you wish. There are no penalties for early, late or no withdrawals, and no minimum withdrawal requirements. Although you can withdraw the money you put in without having to pay any taxes or penalties, with a few exceptions there are penalties for withdrawing your earnings before you reach age 59½. 3. Is your growth predictable and guaranteed? Your growth is both predictable and guaranteed. You receive a guaranteed annual increase, plus you have the potential for dividends, which, while not guaranteed, have been paid every single year for more than 100 years by the companies recommended by Bank On Yourself Authorized Advisors. To find out what your bottom-line numbers could be, how much your financial picture could improve if you added Bank On Yourself to your financial plan, and to get a referral to a Bank On Yourself Authorized Advisor (a life insurance agent who has advanced training on the ins and outs of this concept), request a free Analysis here. If your money is invested in the market, you could lose some or all of your money and you have no way of predicting the value of your plan when you hoped to tap into it.